Excerpt: Preface; THIS volume is divided into seven parts. First we have Tales for Children, published about the year 1872, and reminding us of the time when Tolstoy was absorbed in efforts to educate the peasant children. 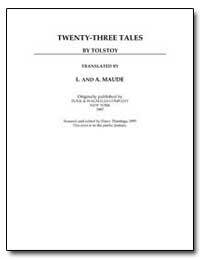 This section of the book contains the two stories which of all that he has written Tolstoy likes best. In What is Art? he claims no place among examples of good art for any of his own productions 'except for the story God sees the Truth, but Waits, which seeks a place in the first class (religious art), and A Prisoner in the Caucasus, which belongs to the second (universal art).' In the first of these the subject (a favourite one with Tolstoy) is the forgiveness of injuries. The second deals with the simplest feelings common to all men: fear and courage, pity, endurance, &c.' expressed with that individuality, clearness, and sincerity, which Tolstoy says are the signs of true art.